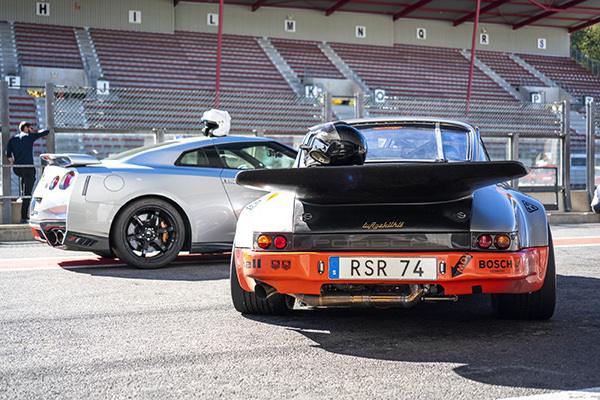 Join us for two days of driving on the legendary Spa-Francorchamps. A track that many say is the best in the world. Welcome to Spa-Francorchamps - the track that many say is the best in the world. No other track has so much racing history as this 7km circuit in Belgium. Built as early as 1921 - six years prior to the Nurburgring - it was originally using public roads between the Belgian towns of Francorchamps, Malmedy and Stavelot. It is located in the mountains of the Ardennes, hence the steep up- and downhill sections. Spa-Francorchamps also has the best corner in the world - Eau Rouge. There is no other corner that is as challenging and scary and rewarding as Eau Rouge. On any other race track. Period. While the event is limited to 82 cars, you can be sure there will be lots of free laps on the track. No congestion, no dangerous overtakings, just an amazing time for you and your super car. We drive according to open pit lane regulations, which means you can enter the track whenever you want - no waiting in line for your turn to go. Sadly, we do not allow any racing cars or slick tires to this event. Check-in to the event is in the lobby of Hotel de la Source on the afternoon of the 14th of October. The drivers briefing and dinner starts at 20.00 in the hotel. The following two days we have Spa-Francorchamps entirely for ourselves. Driving is from 9 to 18, with a break for lunch between 12 and 13. Instruction and full hospitality with lunch on the track is included. During the evening of 15th of October we have a BBQ dinner in the hotel starting from 20.00. 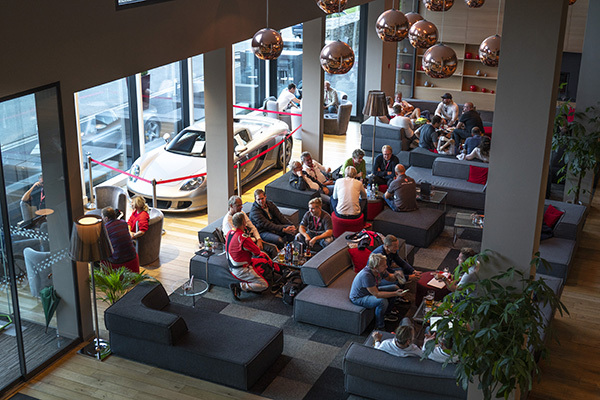 On the final day of the event we finish the event with Gran Turismo After Track in the hotel bar, followed by the traditional closing dinner and award ceremony. Check out from the hotel is at lunch time the following day. Whether you are a beginner to Spa-Francorchamps or a master of this track, we have several very experienced instructors available for you during the event. This is included in the fee. For Gran Turismo Spa we stay in Radisson Blu Palace, a four star hotel located in the village of Spa near by. You can join the event without staying with us in Hotel de la Source, at a reduced cost. Everything else is always included. Just let us know when you register. Ever since we started over a decade ago, we have always done things differently than other organisers. Our events are not just about driving, they are just as much about meeting people that love driving, too. Hence, we always have the entire group stay at the same hotel, organise welcome and closing dinners, parties, special events and lots of other social activities during the events. We call this the Gran Turismo experience. Welcome to our community of super car drivers! 08.30 - 9.00 Safety briefing. 09.00 - 10.00 Driving - only beginners. 10.00 - 12.00 Open pit track driving. Refreshments and instruction available. 09.00 - 12.00 Open pit track driving. Refreshments and instruction available. 13.00 - 18.00 Open pit track driving. Refreshments and instruction available. 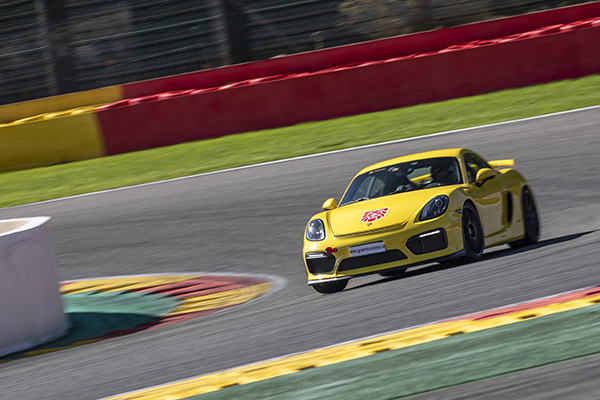 Track driving: Two full days of exclusive driving on Spa-Francorchamps with world-class instruction. The event is strictly limited to 82 cars. No race cars or slick tires allowed. Hotel: Three nights in Radisson Blu Palace in Spa **** with breakfast and safe parking for your car. The hotel is located just by the track. Full hospitality: Welcome- and closing dinners in the hotel, barbecue dinner in the hotel, catered lunches on the track with snacks & coffee available throughout the day. Also included: Professional photos taken from the event. Our famous event polos are also included, for both the driver and the co-driver. Transport option: We have a transport available from Scandinavia to Spa-Francorchamps and back. For questions regarding registration, please contact us on registry@granturismo.org. Optional message to the organisers. 1. General Information This is an event and not a race. Participants must not compete at any level with other participants and must not place any bets relating to this event. Anyone found doing this will be removed immediately from the event with immediate effect and the remainder of your trip canceled without refund. You must drive with care and attention for your own safety and the safety of others. 2. Entry Fee All entry fees must be paid according to your invoices due date, any failure to do so will result in the team being removed from the event and a charge of EUR 250 will be charged for late payment. If a participants is removed then the first person on the reserve list will be asked to join the event. 3. Age restrictions All participants must be over 18 years of age in order to enter the event. 4. Comply All participants must adhere to all applicable laws and regulations of each and every country you travel in, this includes without exception all speed regulations, laws of the road, laws relating to the safety of your vehicle and laws relating to the possession or use of alcohol, drugs or other prohibited substances. You cannot participate in any other vehicle than the one you are registered with unless specifically authorised by the organisers. Participants involved in this event must participate fully, if for any reason you decide to withdraw from the event your fee is neither transferable nor refundable under any circumstance. 5. Responsibility Gran Turismo Events accepts no responsibility for the consequences of you being refused entrance or exit in to or out of any country or city during the event including any cost incurred, this is all the participants responsibility and in particular any additional costs incurred are solely the participants responsibility. 6. Code of conduct All participants must conduct themselves sensibly at all times and act responsibly at each of the venues on route. All participants must provide a credit card as a security deposit when entering the accommodation provided and will be charged for any extras or damages before leaving the venue. You must NOT: * Consume alcohol whilst driving nor drive under the influence of alcohol or any other intoxicating substance at any time during the event. * Drive if your ability to do so safely and properly is in any way compromised by illness, lack of adequate rest, or any other condition. 7. Indemnify You will indemnify the organiser, its directors, officers, employees and consultants against any and all claims, lawsuits and causes of action whatsoever or howsoever arising and brought against them by any third party as a result of your action or participation in the event, including without limitation, your violation of any laws or regulations or your breach of these Terms and Conditions of entry. 8. License and Insurance All drivers must hold a full valid and unrestricted drivers licence. 9. Foreign Compliance Each team is responsible to prepare their car and know, understand, and comply with any applicable driving laws of any country they visit during the event. 10. Branding You agree to have the Gran Turismo Events- and all official event sponsors stickers placed on your vehicle at all times during the event. You are responsible to keep all stickers clean and visible at all times. All stickers are non-permanent and are easy to remove and will not leave any damage to your vehicle. The organisers are therefore not responsible for any claims of damage to your vehicle as a result of applying or removing of such stickers. If you do not display all Gran Turismo stickers at all times during the event you will be removed from the event with immediate effect and the remainder of your trip canceled without refund. 11. Team Sponsorship All sponsorship has to be authorised by the organiser and you will need to receive written consent from the organiser to place any sponsor(s) logos on your vehicle or clothing. Each team are allowed as many sponsors as they wish to help fund their partcipation. Team sponsors are allowed with no restrictions on size as long as you have the official Gran Turismo stickers in place (1 driver door, 1 passenger door). The organiser reserves the right to refuse any unauthorised sponsored vehicles or individual participants entry to the event. If your team arrives at or attempts to participate in the event displaying any branding of a sponsor that has not been authorised by the organiser, you will be required to remove it immediately. Any failure to do so will result in refusal to the event and loss of any participation in the Event and you shall not be entitled to a refund of your entry fee. 12. Refunds NO refunds of any kind including the entry fee will be made under any circumstances (including, without limitation, if at any point after you have entered the Event (i.e. after paying any sum towards taking part in the Event) you are unable to participate for any reason. There will not be any refunds during the whole period of the event. If you are unable to continue in the event for any reason whatsoever the Organiser will NOT make any refunds of the entry fee or pay compensation to you. The Organisers reserve the right to change the event schedule without prior notice if and when they wish to do so. Any participant dropping out of any part of the event for any reason will not be entitled to any compensation. 13. Violation of terms If any participators violate any of the above terms and conditions or refuse to follow the instructions given to you prior or during the event by the organiser, you may be prohibited from any or further participation in the event. 14. Refusal The Organiser reserves the right to refuse participation in or to cancel the Event at any time for any reason whatsoever (without being obliged to disclose the reason). 15. Image rights All participants acknowledge and consent to be photographed and to be included in any filming of footage documenting the event. You hereby waive any and all rights of publicity or privacy and grant the organiser full and complete permission to utilise and exploit your appearance in the event in any and all manner and media throughout the world in perpetuity. You also agree that the Organiser have the sole discretion to use or refuse to use any photographs or footage in which you appear, and that if the Organiser does use such photographs or footage, it may be edited at the Organisers sole discretion. You consent to the use of your name, image, likeness, voice and biographical material about you in connection with any and all footage, publicity and related promotional material and for any and all publicity and promotional purposes. You expressly release the Organiser and all its employees, consultants, licensees and assigns from and against any and all claims which you have or may have for invasion of privacy, defamation or any other cause of action arising out of the production, distribution, broadcast or exhibition of photographs, footage or any promotional materials. All participants are only entitled to take photographs and film footage of your participation in the event for NON-commercial purposes and only for personal and private use only. You are not entitled to reproduce or use photographs or footage of the event on any website, in any printed media or in any television programme without first obtaining the prior written consent of the organiser. You hereby agree to assign (by way of present assignment of future copyright) all your right, title and interest in the world-wide copyright and all intellectual property rights in such photographs or footage in perpetuity together with exclusive world-wide rights of exploitation thereof to Gran Turismo Events. You shall deliver to Gran Turismo Events within 30 days of the end of the Event, at no cost to Gran Turismo Events, a tape in DigiBeta (PAL) or in DV (PAL) format of all the footage originated by you at the Event and copies of all photographs taken at the Event. 16. Gran Turismo Events branding You are not permitted to use the "Gran Turismo Events" logos or branding under any circumstance other than placing stickers on your vehicle. This includes any printed material or websites. 17. Terms and Conditions changes The organiser reserves the right to change these terms and conditions from time to time subject to notifying participants of the changes. You shall be deemed to have accepted the amended terms and conditions by participating in the Event. 18. Law These terms and conditions and your participation in the event are governed by Swedish law, and you submit to the jurisdiction of the Courts of Sweden.